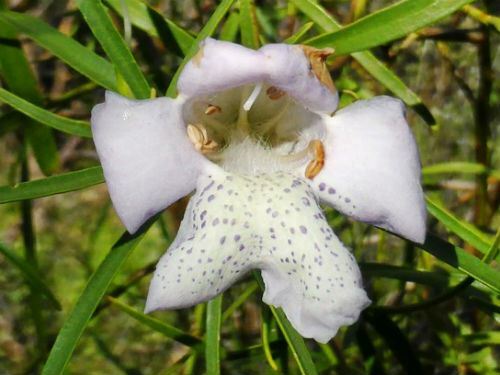 Eremophila polyclada, the Flowering Lignum, grows in inland areas of all mainland Australian states except Western Australia. This species is a tangled, spreading shrub that reaches a height of three metres in our cold climate garden. Leaves are narrow, light green and up to six centimetres long. The large, eye-catching, tubular flowers are three centimetres long. They are white or purplish white with green or brownish spots. The main flowering period extends from September to May. Our specimens never seem to be without some blooms. The flowers are probably the largest of any in the genus. Light pruning will keep the foliage from becoming too straggly. In common with most Emu Bushes cuttings will produce roots rapidly. The species name means many branches.